At our Salem eye clinic, we doctors see numerous sports and recreation-related eye injuries occur that could have been easily prevented. A recent study found that over 30,000 patients arrive at emergency departments all across the United States with sports-related eye injuries each year. The vast majority of these individuals were younger than 18 years old, and many were younger than 10. Since this study only evaluated ER visits, the true occurrence of sports related eye injuries may be greater than 60,000 per year. However, ninety percent of sports-related eye injuries may be prevented with protective eyewear. Activities with the greatest risk for sports-related eye injuries include baseball/softball, ice hockey, racquet sports, basketball, fencing, lacrosse, paintball, and boxing. Baseball actually ranks as the leading cause of sports-related eye injury in children aged 14 and under, while the leading cause of sports-related eye injuries among 15- to 24-year-olds is basketball. While responsible for a number other potentially serious injuries, playing football causes very few eye injuries. Soccer is a common contributor to sports related eye injuries for girls. To prevent injury, it’s important to wear protective sports eyewear with polycarbonate lenses while playing any sport that presents a risk for an eye injury. For activities such as baseball hitting, hockey, or paintball, a helmet with a shatterproof, polycarbonate face mask should always be worn. A wire shield on a helmet may be acceptable for hockey. Appropriate eyewear should have been evaluated to meet the American Society of Testing and Materials (ASTM) standards. Both the Canadian Standards Association and Hockey Equipment Certification Council give approval to appropriate face masks for hockey. It is particularly important that the level of eye protection corresponds to the activity. Everyone should be educated that ordinary prescription eyeglasses do not provide appropriate sports related eye protection. Severe injuries can even occur while fishing. Appropriate protective eyewear should wraparound the face and provide adequate side protection to prevent a high-speed fish hook projectile from striking the eye at an oblique angle. Significant, possibly blinding, eye injuries may occur in full contact sports such martial arts or boxing. Boxing rarely involves adequate eye protection and thus participation in this activity should be carefully evaluated. 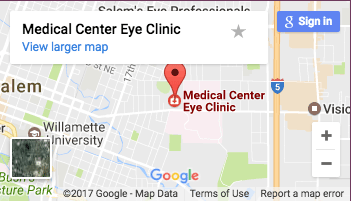 If an eye injury occurs, a visit to our Salem eye clinic or an emergency room should happen as soon as possible. Do not rinse the eye with water or apply ointment. Considering the data that is now available regarding the frequency of sports related eye injuries, particularly with children, we should strive to make protective eyewear both desirable and stylish in youth sports. If you have any questions on the best ways to prevent eye injury, feel free to ask any of our doctors during your next visit to our Salem eye clinic at the Medical Center Eye Clinic.